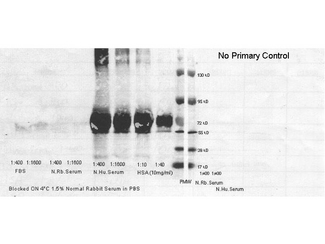 Serum Albumin antibody LS-C18954 is an HRP-conjugated rabbit polyclonal antibody to human Serum Albumin (ALB). Validated for ELISA, IHC and WB. 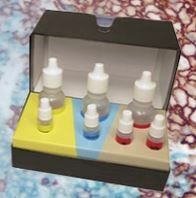 Suitable for immunoblotting (western or dot blot), ELISA, immunoperoxidase electron microscopy and immunohistochemistry as well as other peroxidase-antibody based enzymatic assays requiring lot-to-lot consistency. The applications listed have been tested for the unconjugated form of this product. Other forms have not been tested. Store vial at 4°C prior to restoration. Restore with 1.0 ml of deionized water (or equivalent). For extended storage add glycerol to 50% and then aliquot contents and freeze at -20°C or below. Avoid freeze-thaw cycles. Secondary Antibodies - Western Blot. secondary antibodies detect rabbit primary antibodies in a variety of platforms. Shown here is a serial 1:1 dilution of control rabbit IgG protein ( 250 ng starting total load) co incubated with LS-C60865 and 1:20K in MB-070. Blot was dried and imaged (A) on Bio-Rad Versa Doc (30 sec, DyLight649), (B) LiCor Odyssey Reader (700 nm), (C ) Rewetted incubated with Femtomax 110 reimaged using BioVersaDoc (for 60 sec), (D) Incubated with TMB substrate TMBM for 5 minutes and scanned, and (E) Rewetted for Chemiluminescence and imaged for 90 sec on the BioRad VersaDoc Imager,. This image was taken for the unconjugated form of this product. Other forms have not been tested.